The inaugural Ida B. Wells Society investigative reporting boot camp at North Carolina Central University in Durham. The Ida B. Wells Society for Investigative Reporting represents a new take on a familiar mission. We are a news trade organization whose mission is to increase the ranks, retention and profile of reporters and editors of color in the field of investigative reporting. The Society seeks to raise the awareness of, and opportunities for, investigative reporting among journalists of color and to foster the desire for social justice journalism and accountability reporting about racial injustice. 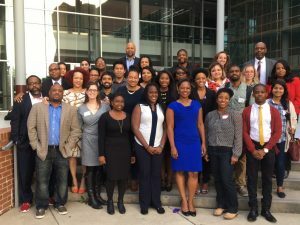 Although there are journalism membership organizations that provide training and skills building for investigative reporting and others that serve as advocates for diversity in newsrooms and media organizations, none of these groups adequately serve journalists of color who are interested in opportunities in investigative reporting. Today, even as ongoing racial inequality roils the national landscape, too few of the journalists doing investigative reporting come from the communities suffering the most. The ranks of investigative reporters in the nation’s newsrooms continue to be overwhelmingly white. Our mission is to do something about that. The Ida B. Wells Society for Investigative Reporting and ProPublica are pleased to announce their partnership for the Data Institute, a 2-week intensive workshop on how to use data, design and code for journalism. The free program will take place from July 22 – August 2, 2019, at The New School in New York City. Learn more and apply here!